Exhibition for the Metropolitan Museum of Art created to showcase how makeup has evolved and become a part of women's (and men's) lives for over 164,000 years. 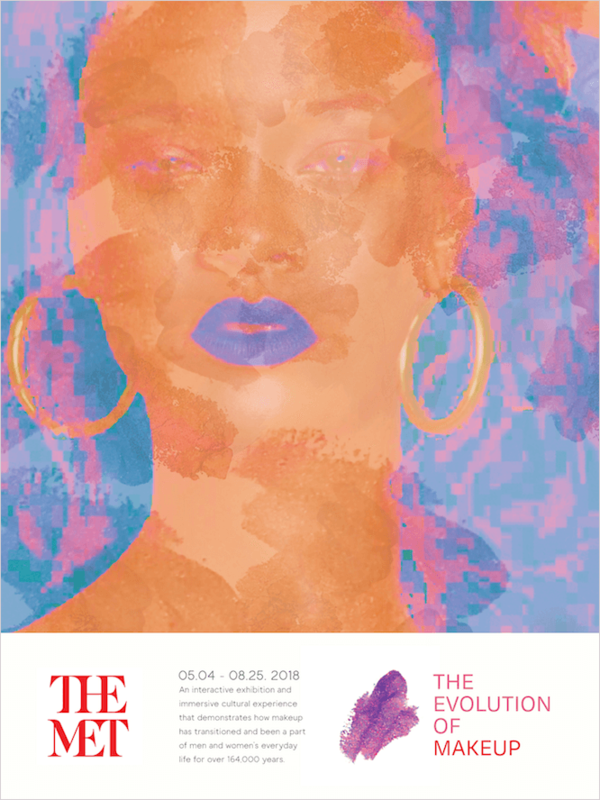 Five posters featuring five prominent beauty influencers were designed as advertising for the exhibition. Each design can be used for multiple forms of advertising. A timeline of beauty influencers and quotes will welcome guests as they enter the museum. Advertisments will be placed throughout Manhattan neighborhoods, in Times Square, on subways and bus shelters, and inside fashion magazines. Kiosks using augmented reality will be placed throughout the exhibition. Guests can "virtually" try on the makeup looks featured, and will receive a photo via email of themselves in each trend. Dozens of logos have been designed to change with every brand execution. Five original makeup marks were created and then colorized to represent the colors and makeup of each time period. The following interactive microsite will show users the timeline of the history of makeup and offer a virtual tour of the exhibition. A map of the exhibition will be provided for all guests. The following Snap Chat filter will be offered to those within New York City, for two weeks prior to, and during, the exhibition.